I like to try different recipes to cook delicious and nutritious breakfast for my family because breakfast is the most important meal of the day. Are you bored with the regular toast and scrambled eggs for breakfast in the morning? Now it is time to try something new. 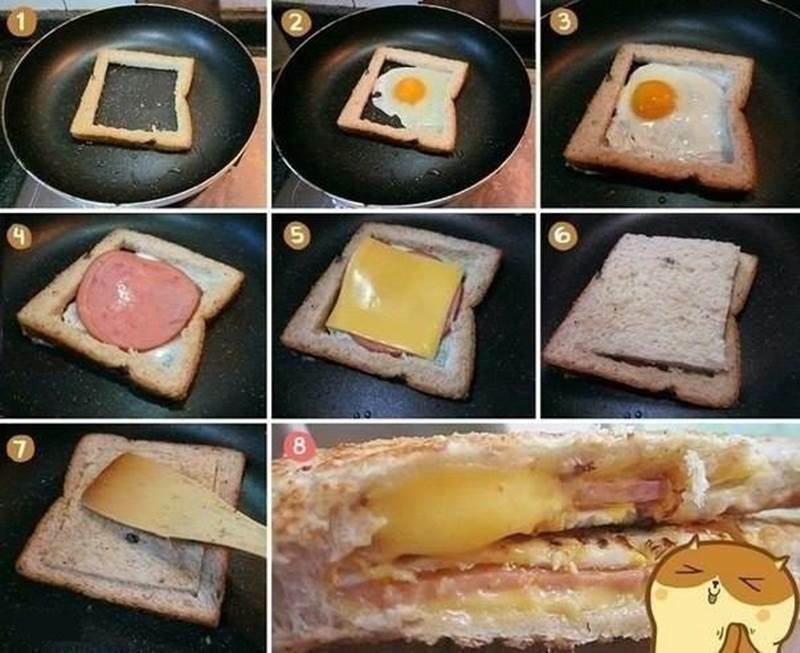 Here is a super easy way to make delicious sandwiches. They are savory with all our favorite breakfast goodies wrapped into nice little package: eggs, ham or sausage, cheese and even bacon! They are also convenient and rather easy to eat if you are running out of time for a good breakfast in the morning. Just grab one or two on the go. Let’s try it! Pour a little bit of cooking oil in a frying pan. Take a piece of bread and cut out the middle (put aside for use later), leaving the edges on and place it in the pan. Crack the egg inside the bread. When the egg is almost done, place a piece of ham on it. Place a piece of cheese on the ham. Wait for the cheese to melt. Place the middle part of the bread on top again. Use a spatula to press down the middle part. Remove the stuffed bread from the pan and stack on another piece of bread. Enjoy the yummy sandwich!